Introducing the first all-in-one nonprofit system that is designed for Habitats. Sign up today to get the limted release for January 2016 mortgage payment options. Process mortgage payments and track sweat equity, all with one system. We connect Mortgage and Family Partner managers - mortgage payment, homeowner application form, sweat equity classes, volunteering and more, all in one system. Every change is automatically updated, every payment run is automated. 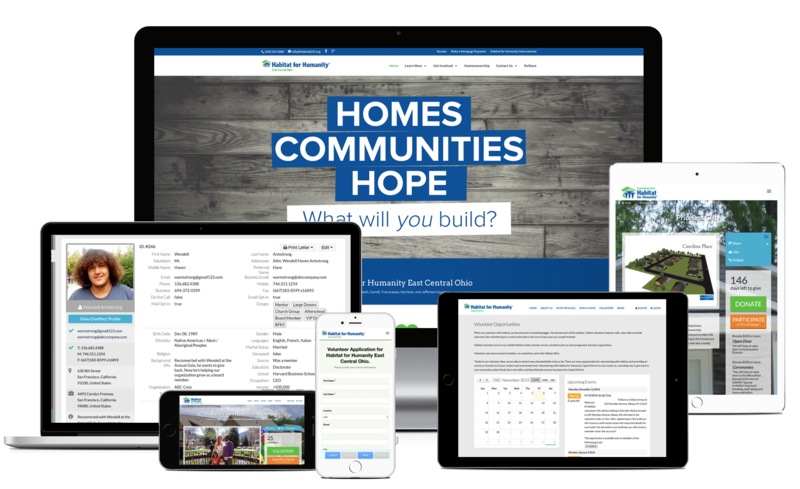 Habitat for Humanity affiliates can create homeowner application forms with the Giveffect Form Builder. Collect and track all the data you need. Opt-in to manage homeowner and family partner mortgages. Every payment is charged automatically. Host Sweat Equity classes with Giveffect's Event Builder to manage all courses, from: homeowner maintenance education to financial literacy courses. New homeowners need to complete hours of sweat equity to invest in their future. Track their hours spent with the Giveffect nonprofit software. Get total visibility into all Family Partners. Keep in touch like never before. You and your Habitat colleagues can easily assess all homeowner applicants and family partners. Reach out to them right in the same system. Receive combined summary report per individual. Discover if homeowners has completed their sweat equity hours, volunteered, donated, or more. Generate reports to learn more about your homeowners and partner families. Find out if they are on track with a push of a button. Send an email to an individual, a group or the whole community. All direct emails may be send from the Giveffect email system. Design newsletters with Giveffect's Newsletter Builder. Making it easier for your Partner Family managers to send out updates. Engage: Homeowners and Partner Families Give Back. Integrate new homeowners and partner families with Giveffect's Community Outreach tools. From volunteering, selling event tickets to starting their own fundraisers. Ready for Giveffect's all-in-one nonprofit system?